These tacos are one of my favorites… such a great combo! The avocado is oven-fried, resulting in crunchy breading and creamy, decadent avocado. Served in a lettuce boat with pico de gallo and spicy Sriracha aioli, it has a freshness and a bit of a kick. Indulgent tasting and totally satisfying but still fresh and light. Crispy avocados adapted from an Eating Well recipe, they are super easy to make and beyond delicious. The Sriracha aioli is a long time favorite and can be made as spicy as you like. Pico de gallo can be store-bought or easy recipe below. Best part is, the entire meal can be made ahead and heated up as needed. Creamy, decadent avocado with a crunchy breading served in a lettuce boat and topped with pico de gallo and spicy Sriracha aioli. Indulgent tasting and totally satisfying but still fresh and light! Super simple Crispy Avocado recipe adapted from Eating Well. Romaine lettuce leaves, approximately 5 inch in length. Preheat oven to 425°F and place parchment paper or non stick foil on a baking sheet. Create an assembly line with 3 shallow bowls. In the first bowl mix flour, salt & pepper. The second, lightly beat the eggs. And in the third, place the panko breadcrumbs. One at a time, coat the avocado wedges in the flour, shake off excess, then dip in the egg. Then coat both sides with the panko, pressing to help it stick if needed. Place the wedges on the prepared baking sheet. When all the avocados are prepared, bake until golden brown, turning halfway through, approximately 15-20 minutes. Whisk ingredients together until smooth and creamy. 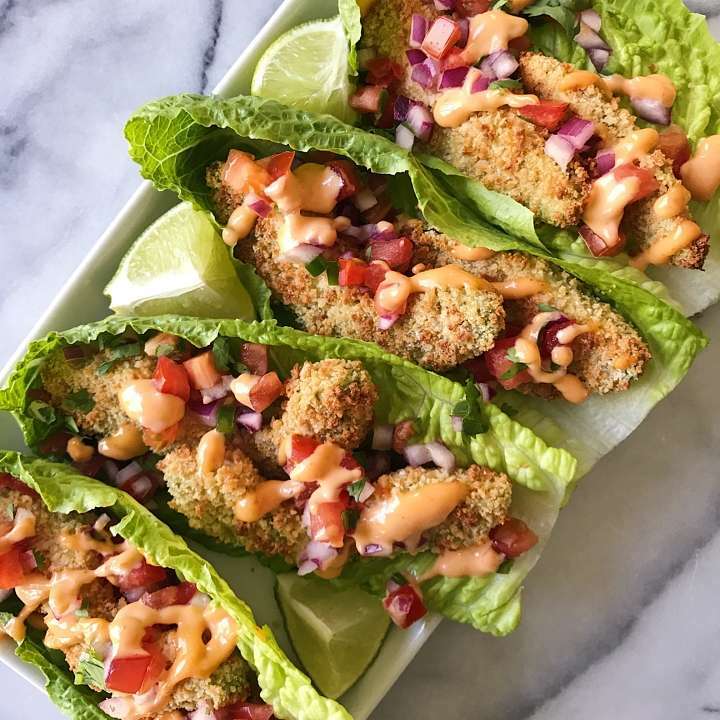 In each lettuce boat add 2-3 avocados, top with pico de gallo and sriracha aioli. Enjoy! So happy you love them too! Thanks for sharing!